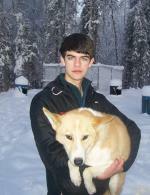 Noah Pereira, 16, says he started mushing in 2007 when he met a few local mushers and then wanted a team of his own. His team in New York is a sprint team. He’s been working with Dallas Seavey for two years in anticipation of running the Jr Iditarod. He is in the 11th grade at Brockport High School and participates in Environmental Club and Varsity Soccer. He also enjoys hunting and fishing. He plans to go to college after high school and says, “yes”, he will continue mushing.